Steve Rice (Olympia, United States) on 28 September 2010 in Art & Design and Portfolio. A sculpture, Shattering Silence, near the Iowa Supreme Court. Such an interesting sculpture again! Great composition and colors Steve! Great angle! Yes, a portal to justice perhaps? I like the glimpse of the court building in the background. Great shot, very sharp and luminous, and fantastic sculpture! amazing shot ! its a great angle! Wow.. great light and details. Love the clarity and tones. very interesting sculpture. A very nice sculpture, in such a blue sky ! There seem to be a rash of new sculptures being placed around . . I quite like the geometry of this one and how you have related it to the building beyond. 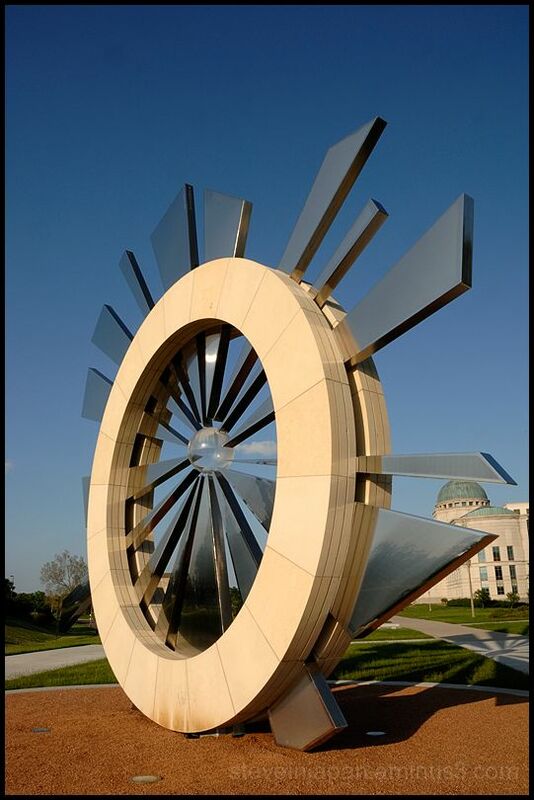 It does remind me of a stargate.. really cool sculpture and perspective you've captured. looks like something from His Dark Materials. Wonderful composition and clarity ! Star gate it is....... it's very futuristic. Brilliant shot that has called me back 4 times now. A strong picture for its detail and color. I like the crisp image. It's a very interesting subject too. Nice one. Amazing. it IS a stargate! this image is perfectly exposed and love the perspective as well. I am really impressed with all the unique sculpture and artwork you've been featuring. I hope to one day see some of these in person. Thank you for this introduction to American art -- very impressive. love it very much! an outstanding POV and neat colors, thanks for sharing!! Perfect shot ! Elegant ! An eye-catching piece of art that you captured from a great angle with the Supreme Court in the background. Beautiful blue sky as well. WOW! Fabulous find! Majestic statue! Perfect light and color! very interesting composition!!! Your angle is very interesting, i like this ! a beautiful and original sculpture. Excellent framing! Beautiful light and colors! An exquisite rendition. Your framing shows us the 'cutting edge' sculpture contrasted with the rounded softened beauty of architecture behind it. They complement one another !! Splendid ! An incredible sculpture. Wonderful composition, POV and everything. I love seeing the country through your lens.